Breeds of Sheep in different agro-ecological regions in India and their major products. Within parenthesis is the major product of the breed. (AW), Apparel wool; (CW), Carpet wool; (MCW), Mutton and Carpet wool; (M), Mutton . Avikalin :Avikalin strain has been evolved from Rambouillet x Malpura half-bred base through inter breeding and selection for greasy fleece weight, producing about 1.75 kg greasy wool having 27 microns diameter, 27% medullation and staple length of 4.75 cm in half yearly clip. This breed is quite suitable as a dual purpose sheep for carpet wool and mutton production. 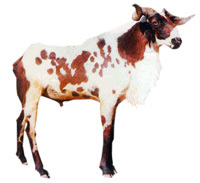 Balangiri:This breed is spread over north western districts of Orissa, Balangir, Sambalpur and Sundargarh. They are medium sized, white or light brown or of mixed colours. A few animals are black. The ears are small and stumpy. Males are homed and females are polled. The tail is of medium length and thin. The legs and belly are devoid of wool. Fleece is extremely coarse, hairy and open. Bellary : Distributed in Bellary district of Karnataka. Sheep found to the north of the Tungabhadra River are called “Deccani” and those to the south of it are called as, “Bellary”. Medium-sized animals, with body colour ranging from white through various combinations of white and black to black. Fleece is extremely coarse, hairy and open; belly and legs are devoid of wool. Means of body weights at birth, three, six and twelve months of age were 2.60, 11.09, 16.28 and 18.68 Kg, respectively. Average 6-monthly greasy fleece weight was 300g with average fibre diameter of 59.03 micron and Medullation percent of 43.43. Litter size is single with rare case of twinning. 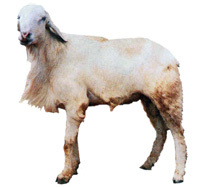 Bharat Merino Sheep : Bharat Merino sheep developed by crossbreeding indigenous Chokla and Nali sheep with Rambouillet and Merino rams and stabilised at 75% exotic inheritance has the potential as an import substitute for exotic fine wool inheritance. The annual greasy wool production is 2.5 kg with fibre diameter of 19‑20 microns, medullation less than one percent and staple length in annual clip at Mannavanur of 7‑8 cm. From SRRC, Mannavanur Bharat Merino sheep were distributed to Kolar District of Karnataka and in Sathyamangalam and Thalavadi areas of Erode District in Tamilnadu. The average body weight of Bharat Merino sheep at Kolar District was found to be 45 kg and 32 kg, ranged from 38-70 kg and 28-40 kg for adult male and female respectively. Birth weight of lamb was 4.0 kg with range of 3.5-4.5 kg. The weight at 3, 6, and 12 months were 18, 25 and 30 kg, respectively. 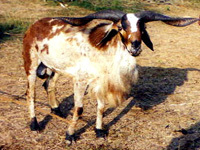 Bonpala : This breed is found in southern Sikkim. The animals are tall, leggy and well built. Fleece colour ranges from completely white to completely black with a number of intermediary tones. Ears are small and tubular. Both sexes are homed. The tail is thin and short. The belly and legs are devoid of wool. Fleece is coarse hairy and open. Average six monthly greasy fleece yield is 500 g. Fibre diameter is 49 µ with Medullation percent of 70.5. Chokla :This breed is distributed in Churu, Jhunjhunu, Sikar andbordering areas of Bikaner, Jaipur and Nagaur districts of Rajasthan. Animals true to the breed type are found in Sikar and Churu districts. The animals are light to medium‑sized. The face, generally devoid of wool, is reddish brown or dark brown, and the colour may extend up to the middle of the neck. The skin is pink. The ears are small to medium in length and tubular. Tail is thin and of medium length. The coat is dense and relatively fine, covering the entire body including the belly and the greater part of the legs. 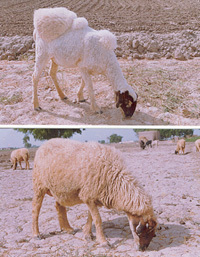 Chokla is fine carpet wool Indian sheep and reared basically for its wool quality and suitability for migration. Chokla grows the finest carpet wool of all the Indian breeds ranging in its quality number from 54s to 60s count. The wool produced by Chokla sheep is heterogeneous and is generally mixed with coarser fleece of other sheep before utilization as carpet wool. Over the period there is significant improvement in the body weight at different ages and this reflects the effect of selection in the flock. Being a Best Carpet wool breed, Chokla produces wool with average fiber diameter and medullation percentage of around 30m and 30% with staple length of more than 6.0 cm suitable for all kind of carpet preparation. Since 1992, through intensive selection and improved management, six month weight of the sheep has increased significantly from 16.51 kg to 24.83 kg and first 6 monthly GFY increased from 0.918 kg to 1.438 kg. A total of 300 rams were sold / distributed to the farmers or to the Govt. of Rajasthan for breed improvement programme. Chottanagpuri : This breed is distributed in Chottanagpur, Ranchi, Palamau, Hazaribagh, Singhbhum, Dhanbad and Santhal Parganas of Jharkhand, and Bankura district of West Bengal. Animals are small, light in weight with light grey and brown colour. Ears are small and parallel to the head. Tail is thin and short. Fleece is coarse, hairy and open and is generally not clipped. Coimbatore: Distributed in Coimbatore district and adjoining Dindigul district of Tamil Nadu. Medium-sized animals, white with black or brown spots. Ears are medium-sized and directed outward and backward. Tail is small and thin Fleece is white, coarse, hairy and open.The animals are maintained on grazing without any supplementation. Sheep are penned in harvested fields. Rams are both horned and polled while ewes are hornless. Average body weights at birth, three, six and twelve months of age were 2.16, 7.50, 10.83 and 14.77 Kg, respectively. Average 6-monthly greasy fleece weight was 365g with average fibre diameter of 41 micron and Medullation percent of 58. 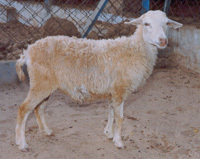 Deccani : The Deccani breed of sheep is widely distributed in the Deccan plateau across the three states of Maharashtra, Andhra Pradesh and Karnataka. The breed has a thin neck, narrow chest, prominent spinal processes. It has Roman nose and dropping ears. The colour is dominantly black, with some grey and roan. Different strains (or within breed types) are observed in the breed tract. Four types have been noticed. Local people term them as Viz. Lonand, Sangamneri, Solapuri (Sangola) and Kolhapuri. Means of body weights at birth, three, six, nine and twelve months of age were 3.13, 14.30, 18.20, 20.10 and 22.57 Kg, respectively for Deccani sheep maintained under NWPSI. Sheep were sheared two times a year and the overall means for lambs first six monthly clip and second six monthly clip and adult annual clips were 467, 499 and 488 g, respectively. Deccani lambs were put on feedlot trails (90 days) after weaning with an initial average weaning weight of 13.23 kg. Final weight at six months of age was 22.65. Average gain of 9.13 kg was obtained with a with a feed efficiency ratio of 1: 5.91. Results shows that the Deccani has the great potential for mutton production under intensive system of management. 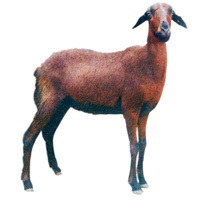 Gaddi : Gaddi sheep are distributed in Kistwar and Bhadarwah tehsils in Jammu province of Jammu & Kashmir, Ramnagar, Udampur and Kullu and Kangra valleys of Himachal Pradesh and Dehradun. Nainital, Tehri‑Garhwal and Chamoli districts of Uttar Pradesh. The animals are medium sized, usually white. Although tan, brown and black and their mixtures are also seen. Males are homed; 10 to 15 per cent females are also homed. Tail is small and thin. The overall least square means for 1st six monthly and adult six monthly were 417 and 454g respectively and least square means of birth, 3, 6, 9 and 12 month’s weight of lambs were 2.22, 7.64, 11.01, 14.01 and 16.19 kg, respectively under farm conditions. Average fibre diameter and medullation were 27.7µ and 20.6 % respectively. Ganjam: Ganjam sheep are found in Koraput, Phulbani and parts of Puri districts of Orissa. The animals are medium sized with coat colour ranging from brown to dark tan. Some animals have white spots on the face and body. Ears are of medium size and drooping. The nose line is slightly convex. The tail is of medium length and thin. While the males are horned, the females are polled. The fleece is hairy and short and not shorn. An annual lambing percentage of 83.6 and mortality percentage of 10.35 have been recorded in farmers' flocks. Under the network project on sheep improvement, field based Ganjam unit was started in year 2001 at Orissa University of Agriculture and Technology, Bhubneswar for mutton. Garole : sheep are reputed for multiple births and are found in the Sunderban area of West Bengal. These sheep are reported to have contributed prolificacy to the Booroola Merino sheep. Sundarban area has a sheep population of about 0.16 million. The breed tract is tropical humid. The climate of the area is hot and humid.Garole Wool is for rough carpet use. The average fibre diameter, medullation, staple length and crimp/cm. Were 67.82 µ, 75.17%, 5.09 cm and 2.08 respectively. Litter size at first lambing is two and at subsequent lambing is 2 to 3. Prolificacy reported is singles 25‑30%, twins 55‑60%, triplets 15‑20% and quadruplets 1‑2%. Hassan: Distributed in Hassan district of Karnataka. Small sized animals. Animals are having white body with light brown or black spots. Ears are medium-long and drooping; ear length. Majority of males are horned and females are usually polled. Fleece is white, extremely coarse and open; legs and belly are generally devoid of wool. This breed is very hardy and capable to travel long distances. Hissardale : Hissardale was evolved at the Government Livestock Farm, Hissar, through crossbreeding Australian Merino rams with Bikaneri (Magra) ewes and stabilizing the exotic inheritance at about 75 per cent. There is a small flock of this breed at the Government Livestock Farm, Hissar. 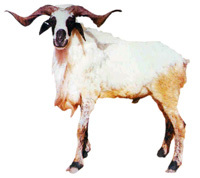 The rams of this breed were earlier distributed in the hilly regions of Kullu, Kangra etc. Jaisalmeri : Jaisalmeri breed is found in Jaisalmer, Banner and Jodhpur districts of Rajasthan. Pure specimens are found in south-western Jaisalmer, extending up to north-western Barmer and southern and western Jodhpur. The animals are tall and well‑built with black or dark brown face and the colour extending up to the neck and typical Roman nose. Long drooping ears, generally with a cartilaginous appendage are seen. Both sexes are polled. The tail is medium to long. The fleece colour is white and fleece is of medium carpet quality and not very dense. 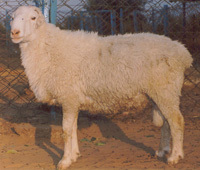 Kashmir Merino : This breed originated from crosses of different Merino types with predominantly migratory native sheep breeds such as Gaddi, Bhakarwal and Poonchi. The level of inheritance varies from very low to almost 100 per cent Merino, though a level from 50 to 75 per cent predominates. The animals are highly variable because of the involvement of a number of native breeds. The annual greasy‑fleece weight (kg) is 2.80 having average fibre diameter of 20.4µ. Kendrapada : sheep is identified as another prolific sheep of India after Garole of West Bengal. It is 2nd sheep breed of India which carry FecB mutation. Kendrapada is distributed in Bhadrak, Konark and Puri district of coastal area of Orissa. A survey was made to study the prolificacy of Kendrapada sheep of Orissa around Kendrapada district and Nimapara (Konark). The survey reveals that Kendrapada is a prolific and excellent medium stature meat type sheep. In the flocks surveyed more than 75 % ewes produces multiple births and the adult body weight of sheep was about 23 kg. The coat colour varies from white to dark brown. Some black animals and black/ white spot on body are also found during survey. Kenguri: Distribution is hilly tracts of Raichur district (particularly Lingasagar, Sethanaur and Gangarati taluks) of Karnataka. Medium-sized animals. The body coat is dark brown or of coconut colour. The breed is also known as Tenguri. Some Kenguri sheep have black belly and are known as Jodka. A few sheep, known as Masaka, are a mixture of brown and black colour. Ears are medium long and drooping. . Males are horned; females are generally polled. Kenguri sheep are maintained for mutton. Lactation length varies from 3 to 5 months, and the peak milk production is 300 to 500 ml/day. Kheri : sheep evolved in the farmers flock under the field conditions especially in the areas that are important for sheep migration in Rajasthan appears to be a need of migratory sheep breeders. The animals of this breed have established owing to their ability to walk long distances and ability to survive on limited amount of coarse feed. The animals of this breed can sustain stress and on return of favorable condition regain faster resulting in better reproduction rate and growth of lambs as compared to prevalent breeds in the area. Kilakarsal : Distributed in Ramnathpuram, Madurai, Thanjavur and Ramnad districts of Tamil Nadu. Medium-sized animals. Coat is dark tan, with black spots on head (particularly the eyelids and lower jaw), belly and legs. Ears are medium sized. Tail is small and thin. Males have thick twisted horns. Most animals have wattles. Average body weights at birth, three, six and twelve months of age were 2.29, 8.53, 14.15 and 27.26 Kg, respectively. Madras Red: Distributed in Chennai, Kancheepuram, Tiruvellore, Villupuram and adjoining areas of Vellore, Cuddalore and Thiruvannamalai districts of Tamil Nadu. Medium-sized animals. Body colour is predominantly brown, the intensity varying from light tan to dark brown; some animals have white markings on the forehead, inside the thighs and on the lower abdomen. Ears are medium long and drooping; ear length. Tail is short and thin. Rams have strong corrugated and twisted horns; the ewes are polled. The body is covered with short hairs which are not shorn. Average body weights at birth, three, six and twelve months of age were 2.71, 9.97, 14.84 and 21.03 kg, respectively. Dressing percentage was around 49. 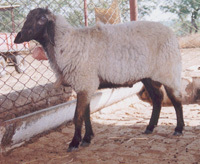 Magra : Magra sheep is distributed in Bikaner, Nagaur, Jaisalmer and Churu districts of Rajasthan. However, animals true to the breed type are found only in the eastern and southern parts of Bikaner district. The animals are medium to large in size. White face with light brown patches around the eyes is characteristic of this breed. Skin colour is pink Ears are small to medium and tubular. Both sexes are polled. Tail is medium in length and thin. Fleece is of medium carpet quality, extremely white and lustrous and not very dense. The average first six monthly greasy fleece yield (GFY) and adult six monthly GFY of Magra sheep under farmers conditions were 0.979 and 0635 kg Average body weights at birth, six and twelve months of age were 3.04, 20.64 and 29.23 Kg, respectively under field conditions. Fibre diameter was ranged between 32.5 to 38µ with staple length ranged from 4.2 to 6.8cm. Under farm conditions, average body weights at birth, three, six, nine and twelve months of age were 2.98, 14.77, 22.06, 25.92 and 27.93 Kg, respectively. Means for first six monthly GFY and adult annual GFY of Magra sheep under farm conditions were 0.912 and 2.071 kg respectively. Average fibre diameter, medullation and staple length were 32.55µ, 49.91 % and 6.47cm. MaIpura : Malpura sheep are found in Jaipur, Tonk, Sawaimadhopur and adjacent areas of Ajmer, Bhilwara and Bundi districts in Rajasthan. The animals are fairly well‑built, with long legs. Face is light brown. Ears are short and tubular, with a small cartilaginous appendage on the upper side. Both sexes are polled. Tail is medium to long and thin. The fleece is white, extremely coarse and hairy. Belly and legs are devoid of wool. The overall least square means for 1st six monthly and adult annual GFY were 551 and 810g respectively and least square means of birth, 3, 6 and 12 month’s weight of lambs were 3.02, 15.41, 20.80 and 25.60 kg, respectively under farm conditions. The average fibre diameter was 41.67µ with medullation of 75.9 %. Staple length was 4.9cm. Mandya: It is also known as Bannur and Bandur. Distributed in Mandya district and bordering Mysore district of Karnataka. Relatively small animals. Colour is white, but in some cases face is light brown, and this colour may extend to the neck. Compact body with a typical reversed U-shape conformation from the rear. Ears are long, leafy and drooping. Tail is short and thin. A large percentage of animals carry wattles. Slightly Roman nose. Both sexes are polled. Coat is extremely coarse and hairy. Evenly placed short and stumpy legs and wide apart hipbones indicated a square type meaty conformation of the breed. Sheep are mainly kept on grazing, however, a few farmers keep the animals on stall-feeding. Some of the farmers practice sheep tethering in their cropland, shifting from place to place and bringing back to their homestead in the evening. Average body weights at birth, three, six and twelve months of age as 2.02, 9.44, 14.61 and 21.34 kg, respectively. Average 6-monthly greasy fleece weight was 298g. Marwari : Marwari sheep are distributed in Jodhpur, Jalore, Nagaur, Pali and Barmer districts extending up to Ajmer and Udaipur districts of Rajasthan and the Jeoria region of Gujarat. The animals are medium size with black face, the colour extending to the lower part of neck. Ears are extremely small and tubular. Both sexes are polled. Tail is short to medium and thin. The fleece is white and not very dense. The overall least square means for 1st six monthly, adult six monthly and adult annual were 607.16, 631.25 and 1260.50g, respectively and least square means of birth, 3, 6, 9 and 12 month’s weight of lambs were 3.05, 14.74, 19.33, 22.85 and 25.90 kg, respectively under farm conditions. Average fibre diameter, medullation and staple length were 31.9µ, 50.8 % and 5.35cm respectively. Mecheri : Distributed in Mecheri, Kolathoor, Nangavalli, Omalur and Tarmangalam Panchayat Union areas of Salem district and Bhavani taluk of Coimbatore district of Tamil Nadu. Medium-sized animals, and light brown in colour. Body is covered with very short hairs which are not shorn. The skin is of the highest quality of sheep breeds in India and is highly prized. Average body weights at birth, three, six, nine and twelve months of age were 2.23, 10.07, 13.73, 18.62 and 21.12 for male lambs and corresponding value for female lambs were 2.28, 9.70, 13.53, 15.84 and 18.02 kg, respectively under farm conditions (Richard Jagatheesan et al., 2003b). Corresponding growth performances recorded in farmers’ flocks were 2.21, 9.64, 13.25, 16.54 and 18.72kg, respectively. Muzzafarnagri : This breed is distributed in Muzzafamagar, Bulandshaher, Sahranpur, Meerut, bijnor and Dehradun districts of Uttar Pradesh and parts of Delhi and Haryana. Pure specimens are found in Muzzafarnagar district. The animals are medium to large in size. Face line is slightly convex. Ears and face are occasionally black. Both sexes are polled. Males occasionally show rudimentary horns. Ears are long and drooping. Tail is extremely long and reaches fetlock. The fleece is white, coarse and open. Belly and legs are devoid of wool. The overall least square means for lambs 1st and 2nd six monthly and adult annual clips were 582.17, 538.75 and 1217.62g, respectively under farm conditions. The overall averages were 3.63, 15.59, 23.52, 27.14 and 30.76kg, respectively at birth, 3, 6, 9 and 12 month age. Least square means of wool quality attributes viz. fibre diameter, hetro fibres, hairy fibres, medullation and staple length were 38.39±1.36µ, 14.35±1.37%, 46.89±3.42%, 61.03±4.33% and 5.09±0.30cm, respectively. Nali : The Nali sheep is found in Ganganagar, Churu and Jhunjhunu districts of Rajasthan, southern part of Hissar and Rotak districts of Haryana. The animals are medium‑sized. Face colour is light brown and skin colour is pink. Both sexes are polled. Ears are large and leafy. Tail is short to medium and thin. Fleece is white, coarse, dense and long‑stapled. Forehead, belly and legs are covered with wool. The overall means for 1st six monthly and adult annual were 1.01 and 2.84 Kg, respectively and means of birth, 3, 6, 9 and 12 month’s weight of lambs were 2.43, 10.74, 14.93, 17.13 and 19.64 kg, respectively under farm conditions. Average fibre diameter, medullation and staple length were 29.89µ, 41.14 % and 6.79cm respectively. Nellore: Distributed in Nellore district and neighbouring areas of Prakasham and Ongole districts of Andhra Pradesh. Three varieties are distinguished, primarily on the basis of colour: “Palla”, completely white or white with light brown spots on head, neck, back and legs; “Jodipi”, white with black spots, particularly around the lips, eyes and lower jaw, but also on belly and legs and “Dora”, completely brown. Relatively tall animals with little hair except at brisket, withers and breech. The rams are horned and ewes are almost always polled. The ears are long and drooping and most of the animals carry wattles. The overall averages of body weight of Nellore sheep maintained under NWPSI were 2.95, 13.91, 17.38, 22.39 and 26.61 kg respectively at birth, 3, 6, 9 and 12 month age. Nilgiri : Nilgiri breed was evolved during the 19th century. It originated from a crossbred base and contains an unknown level of inheritance of Coimbatore, the local hairy breed, Tasmanian Merino, Cheviot and South Down. The animals are medium sized and white, exceptionally with brown patches on face and body. Face line is convex, giving a typical Roman nose. The ears are broad, flat and drooping. Males have horn buds and scurs; females are polled. Attempts have been made by Sheep Breeding Farm, Sandynallah to improve these sheep through crossing with Rambouillet and Russian merino which has resulted in substantial improvement in fleece weight and quality. Means of body weight at birth, 3, 6, 9 and 12 months of age were 2.74, 9.64, 14.06, 17.04 and 19.44 kg respectively. Average six monthly wool yields were 438g with fibre diameter of 24.3µ and staple length of 4.5cm. Patanwadi : Patanwadi is also called desi, Kutchi, Vadhiyari and Charotari. The animals, in general, are medium to large with relatively long legs. They have typical Roman nose with brown face which may be tan in a few cases. Ears are medium to large, tubular with a hairy tuft. The tail is thin and short. Both sexes are polled. The overall least square means for 1st six monthly and adult annual GFY were 566 and 1063g respectively and least square means of birth, 3, 6, 9 and 12 month’s weight of lambs were 3.23, 14.26, 17.67, 20.76 and 24.22 kg, respectively under farm conditions. Average fibre diameter and medullation were 29.11µ and 38.41 % respectively. Pugal : Pugal area of Bikaner district is its home tract. It is distributed over Bikaner and Jaisalmer districts of Rajasthan. The animals are fairly well built. Face is black with small light brown stripes on either side above the eyes; the lower jaw is typically light brown. The black colour may extend to neck. Ears are short and tubular. Both sexes are polled. Tail is short to medium and thin. The fleece is white. Ramnad White: Distributed in Ramnad district and adjoining areas of Tirunalveli district of Tamil Nadu. Medium-sized animals, predominantly white; some animals have fawn or black markings over the body. The ears are medium-sized and directed outward and downward. Males have twisted horns and females are polled. Tail is short and thin. Average body weights at birth, three, six and twelve months of age were 1.68, 7.31, 8.45 and 16.30 Kg, respectively. 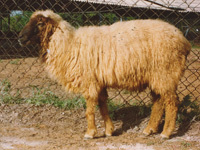 Sandyno: Sandyno breed was developed by crossing Nilagiri sheep with Merino and Rambouillet. The breed has ¾ inheritance from Nilagiri and 5/8 inheritance from Merino / Rambouillet breeds. The breed has been field tested and found to adapt well to the local climatic and environmental conditions. The Sandyno sheep grow to a body weight of 24 kg in males and 20 kg in females at yearling stage. The average wool yield is 2.2 kg. A flock of 320 sheep of Sandyno breed is maintained at Sheep Breeding Research Station, Sandynallah, TamilNadu. Shahabadi: Shahabadi is found in Shahabad, Patna and Gaya districts of Bihar/Jharkhand state. The animals are of medium size and leggy. The fleece is mostly grey and sometimes with black spots. The ears are of medium size and drooping. The tail is extremely long and thin. Both sexes are polled. Their legs and belly are devoid of wool. Fleece is extremely coarse, hairy and open. Average six monthly greasy fleece yield is 240 g. Fibre diameter is 49.83 µ with Medullation percent of 87.08. Sonadi : Sonadi is found in Udaipur and Dungarpur districts and, to some extent, Chittorgarh district of Rajasthan and also extends to northern Gujarat. The Animals are fairly well built, somewhat smaller than Malpura, with long legs. Light brown face with the colour extending to the middle of the neck. Ears are large, flat and drooping; Ears generally have a cartilaginous appendage. Tail is long and thin. The fleece is white, extremely coarse and hairy. Belly and legs are devoid of wool. The overall least square means for 1st six monthly and adult six monthly were 528 and 417g respectively and least square means of birth, 3, 6, 9 and 12 month’s weight of lambs were 2.52, 10.78, 14.98, 17.32 and 21.76 kg, respectively under farm conditions. Tibetan: The Tibetan breed is found in northern Sikkirn and Kameng district of Arunachal Pradesh. Animals are medium sized, mostly white with black or brown face; brown and white spots are also found on the body. Both the sexes are horned. The nose is convex, giving a typical Roman nose. The ears are small, broad and drooping. The fleece is relatively fine and dense. The belly, legs and faces are devoid of wool. Average six monthly greasy fleece yield ranges between 400-900 g. Staple length is 7.24 cm, Fibre diameter is 19.3 µ with Medullation percent of 13.22. Tiruchy Black:Distributed in Perambalur, Ariyalur and Tiruchy, Kallakurichy taluk of South- Arcot district, Viraganur area of Attur taluk of Salem district, Tirupathur and Tiruvannamalai taluks of North Arcot district of Tamil Nadu. Males are horned and ewes are polled. Ears are short and directed downward and forward. Tail is short and thin. The fleece is extremely coarse, hairy and open. Average body weights at birth, three, six and twelve months of age were 2.13, 9.46, 10.73 and 16.80 Kg, respectively. Vembur : Distributed in Vembur, Melakkarandhai, Keezhakarandhai, Nagalpuram, Kavundhanapatty, Achangulam and some other villages of Pudur Panchayat Union and Vilathikulam Panchayat areas of Tirunelveli district of Tamil Nadu. Tall animals. Colour is white, with irregular red and fawn patches all over the body. Ears are medium-sized and drooping. Tail is thin and short. Males are horned and ewes are polled. The body is covered with short hairs which are not shorn. Average body weights at birth, three, six and twelve months of age were 1.97, 8.42, 10.50 and 16.50 Kg, respectively.